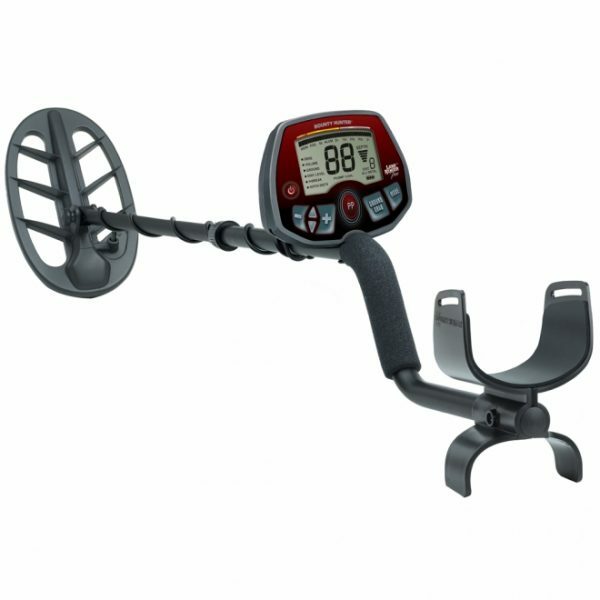 Able to search out coins, jewelry, and relics in mineralized soil conditions, the Bounty Hunter® Land Ranger Pro™ Metal Detector delivers performance both beginner and experienced hunters can appreciate. Featuring Bounty Hunter’s powerful 11″ DD waterproof search coil, the Land Ranger Pro Metal Detector offers 7 search modes and 1 button Ground Grab ground balance. Adjustable sensitivity, volume, discrimination, notch and V-Break variable tone breakpoint help you further fine tune your searches. Adjustable backlit LCD display features 43 Target ID icons (3 for Iron) with 0-99 numerical Target ID numbers, 5-segment active depth indicator and a Pin Point Mode that displays depth in inches. Fully adjustable S-handle pole features locking collars and padded hand grip and arm rest. Runs on 9V battery (not included).